I’ve written about the poui tree in a few earlier posts. I noticed it in my neighbor’s backyard one week, it’s brilliant yellow blooms covering the entire tree, the next, there was a carpet of yellow petals on the ground. I didn’t know what to make of a tree in the tropics that loses its leaves. I was intrigued. When I did a little research, I discovered that in addition to the yellow, there was a pink poui. Where the yellow is striking, more easily identifiable and more common, the pink is less so. It’s beauty is subtle. So off I went, looking for the pink poui. Each time I noticed a profusion of pink petals, I’d pull out my camera but as I got closer, I’d realize that it was some other tree. Or, I’d see the real thing but there’d be no place to stop safely. Weeks turned into frustrating months, one season changed into the next. I’d just about given up ever getting a shot of the pink poui in bloom. One morning as I waited for the bus that would take us on a planned tour, I noticed a pink tree on the opposite side of the parking lot. I didn’t want to get my hopes up until I was sure. I walked slowly towards the tree, camera in hand. As I got closer, I noticed that some petals had already started to rain on the ground, a few were on the cars parked nearby. Yes, this was a poui. I snapped away, hoping the bus wouldn’t arrive before I could finish. It’d have to wait, I thought to myself. 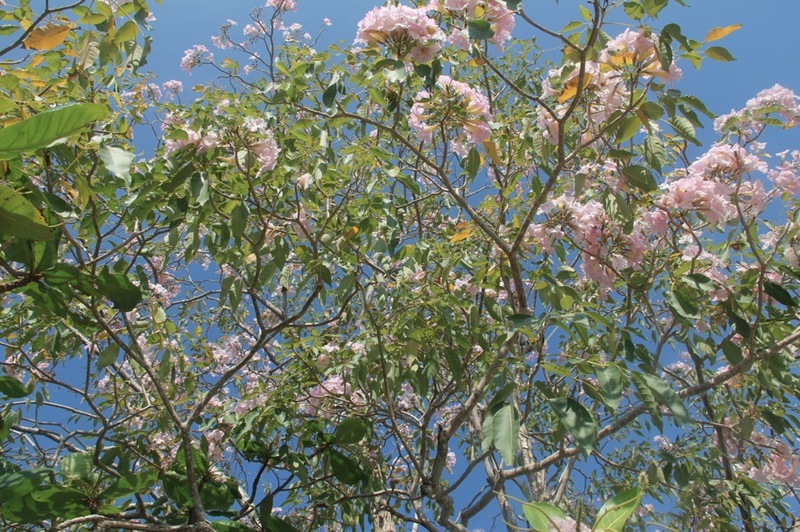 I can’t tell you how happy I was to finally capture a pink poui tree. Nothing could spoil my day after that! For more photos, please check out Travel Photo Thursday, which Nancie at Budget Travel Adventure organizes. Hope to see you there! 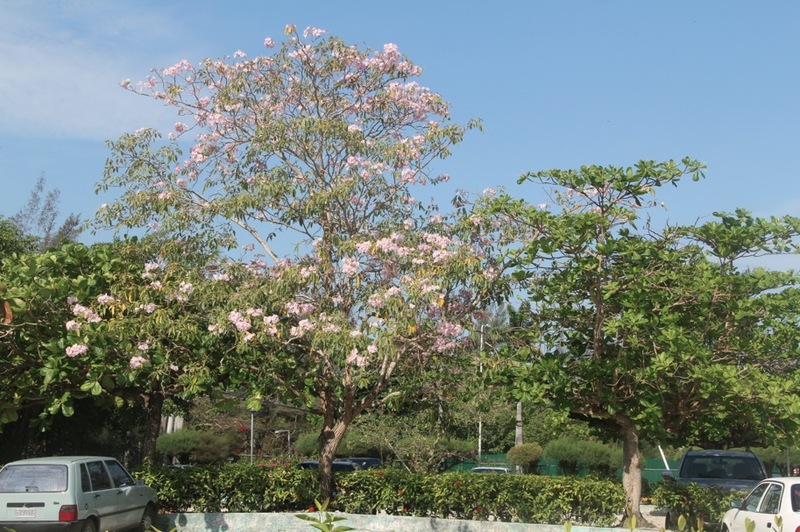 I love tropical flowering trees and this is one of my favorites…haven’t seen the yellow one yet. It was worth the hunt. What a beautiful tree! Thanks for tracking it down for the rest of us. Beautiful, Marcia! I’m glad you were able to capture it close-up. Dedication and patience does pay off 🙂 I remember the yellow ones but the pick has such delicate beauty. I’ve seen this at a botanical garden in LA. I love the contrast in the third photo… with the blue sky. What a wonderful tree; now I want to see one :). Poui tree is beautiful. I like the close-up flower shot. That tree reminds me of what we call rhododendrons, but they are bushy plants. Love those blooms. You were really dedicated to finding such a beautiful tree and I can see why. The flowers look very delicate and I’ve never a picture before of this tree. Thanks for sharing your great find. The tree was worth the patience to find. It’s amazing with it’s delicate flowers. I had never seen pictures of this tree before. Thanks for sharing. 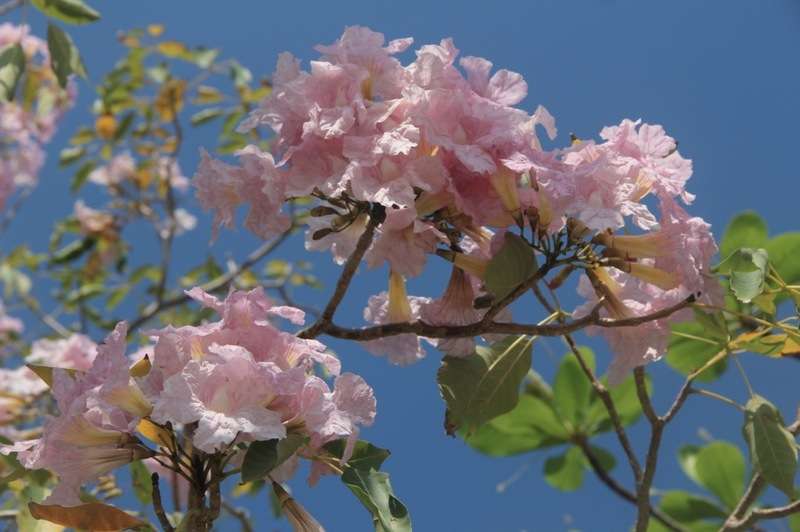 The “Pink Poui Tree” mission…success! It’s always fun to track down the elusive. What a pretty tree! It is a pretty tree and I was very pleased to make this find, Nancie. You’re welcome, Mike. Glad you like the photo. You’re welcome, Neva. It was really worth the effort to find it — it is beautiful. The blooms are beautiful, Jackie. I can see why they’d remind you of rhododendrons. Thanks, Sharlene. Hope you get to see one soon. The pink ones do have a delicate beauty. The yellows are bold and brash. Would be nice to see those at the botanical garden in LA. You’re welcome, Cindy! And yes, it was worth the hung. The yellow is beautiful, bright, and hard to miss when they are in bloom. Very beautuful, Marcia, and the last image is a real gem. The flowers just jump out from that blue background. I must mention here that the cherry blossoms have been out here in Santiago. I’ve posted on them, too, but cannot find out how they got to Chile in the first place. Glad you like the close-up shot, Salika.